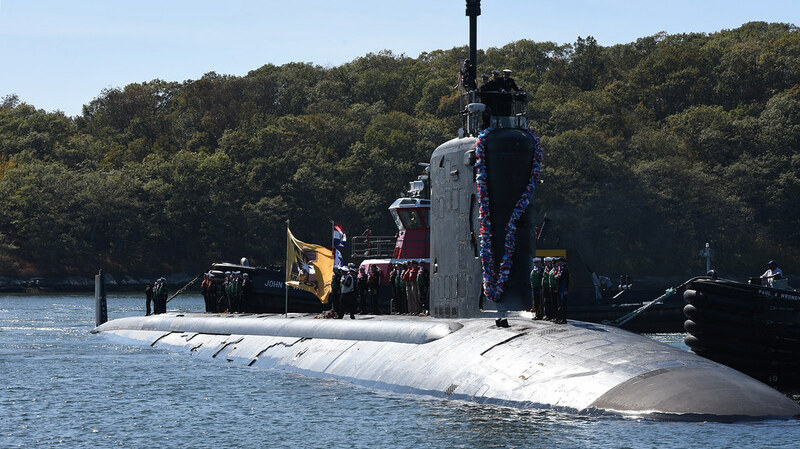 PEARL HARBOR, Hawaii - Virginia-class fast-attack submarine USS Missouri (SSN 780) will arrive at Joint Base Pearl Harbor-Hickam, Jan. 26, for a permanent change of homeport. The submarine has a crew of 140 Sailors and officers. Missouri will be the sixth Virginia-class submarine homeported at Pearl Harbor and the fifth Navy ship to be named in honor of the state of Missouri. The last USS Missouri, the legendary battleship, saw action in World War II, the Korean War and the Persian Gulf War, and the battleship was also the site where Fleet Adm. Chester Nimitz, Gen. Douglas MacArthur and many other U.S. and Allied officers accepted the unconditional surrender the Japanese at the end of World War II. As the most modern and sophisticated attack submarine in the world, the VACL submarine can operate in both littoral and deep ocean environments and presents combatant commanders with a broad and unique range of operational capabilities. VACL submarines are flexible, multi-mission platforms designed to carry out the seven core competencies of the submarine force: anti-submarine warfare, anti-surface warfare, delivery of special operations forces, strike warfare, irregular warfare, intelligence, surveillance and reconnaissance and mine warfare. Their inherent stealth, endurance, mobility, and firepower directly enable them to support five of the six maritime strategy core capabilities - sea control, power projection, forward presence, maritime security, and deterrence. At 377-feet long, Missouri is slightly longer than a football field. She has a 34-foot beam, will be able to dive to depths greater than 800 feet and will operate at speeds in excess of 25 knots submerged. The Pacific Submarine Force, headquartered at Pearl Harbor, includes fast attack, ballistic missile, auxiliary submarines, submarine tenders, floating submarine docks, deep submergence vehicles and submarine rescue vehicles throughout the West Coast and Pacific.